Radha Govind Dham’s Shiksha teaching staff is qualified and passionate about the subjects they teach. Their care and commitment in passing the knowledge they have received to not just their children but to all interested children of upcoming generations are noteworthy. Radha Govind Dham Shiksha welcomes its teaching staff and thanks them for their efforts. WANT TO JOIN RGD AS A TUTOR OR TEACHER? Click here! Educational Background: – Diploma for Kathak classical dance, 5 year program (1977-1982). Concentration: Bharta Natyam classical dance. Received “Grade A Artist” status from the Doordarshan Government of India. Now performs in India’s most prestigious arts and dance festivals and recitals. 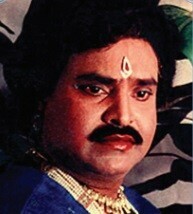 (1989),World Telugu Conference (1990), Republic Day of India at Delhi: 1986, 1988, 1990, 1992, 1995. Rajah Sookraj: My journey of music started with the blessings of Devi Saraswati Ma. At the age of 8, I started to learn classical music from my father, Ustaad Rodhan Sookraj. As time went on, I started to play dholak for many satsangs and religious events. I was very fortunate to have been in company of Shri Hari Om Sharan Ji, and to have learned from him. I played both tabla and dholak for him. 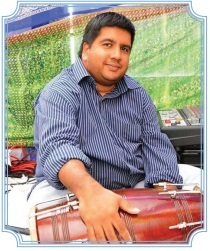 I am an all-rounder musician – I play harmonium, tabla, dholak, and percussions. I have accompanied such world renowned artists as Ustaad Anup Jalota and Mehidi Hassan. It is my honor to render my humble services to the Radha Govind Dham Mandir and I hope to provide upliftment to each student who comes to my classes. 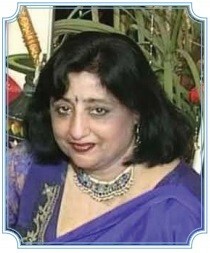 Anita Mitra has been an educational professional within the New York City Department of Education for the past 19 years. 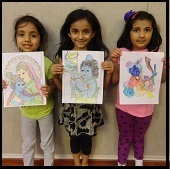 While she currently focuses on teaching English as a Second Language (“ESL”) to children whose primary language is either Bengali or Hindi, Anita has spent previous years cultivating a diverse set of experiences with many different types of students. Prior to her focus as an ESL professional, Anita worked closely with both learningdisabled and physically-disabled students. 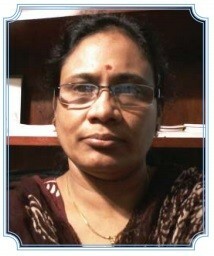 Anita’s rich set of varied experiences, collected over 19 years, allows her to teach effectively and effIciently. Anita eamed a Bachelor of Arts (with honors) in Philosophy and a Master of Arts in Mental and Moral Philosophy from the University of Calcutta. She has completed extensive coursework covering professional early childhood education at CUNY York College and graduate-level credits with the Graduate School of Education at St. John’s University. In addition to her academic coursework, Anita has also completed 100+ hours of workshops and sessions with the United Federation of Teachers’Professional Development Program. Vidya Ramanathan has been volunteering for Samskrita Bharati since 2003, with special focus on teaching Samskritam to children in an enjoyable way. She has helped develop curriculum for children, and has authored a multilingual and fully illustrated children’s book in Samskritam, published by Samskrita Bharati. 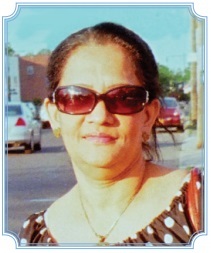 She also works at the Samskrita Bharati office on Hillside Ave, Floral Park, NY. Madhulika Misra has a B. Sc. from Lucknow University in India. She has been employed as an educator by the East Meadow School District and the Nassau Board of Cooperative Educational Services since 2000. She works with special needs children as well as being a substitute teacher at Maria Montessori School in Levittown. She has two daughters aged 8 and 12, and enjoys teaching children and imparting her knowledge of Hindu religion and culture. Rohit Sharma & Jasvinder Gulati have been playing dholak with bhajan groups in New York for a combined total of 17 years. Their focus while teaching the dholak is on uplifting the kirtan session through the quality of sound, timing and rhythm. Their method of teaching is very methodical and lively and they encourage everyone to play during the satsang in some capacity to gain the practical experience of a real time performance. Special Requirements: It will be helpful if students purchase a dholak to practice at home. Alternatively, they may practice at Radha Govind Dham during designated times. Rohit Sharma also teaches Math & Science Homework Help. He has a Bachelors Degree in Mechanical Engineering from the prestigious R.V. College of Engineering in Bangalore. He has fifteen years of experience in the U.S. tutoring Math and Science students from elementary school through high school. 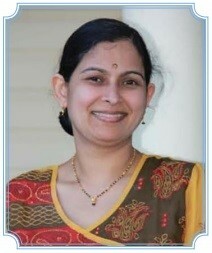 Swarna Sharma will be teaching Hindi. Anuradha Khanna is a Hindustani Classical vocalist and a disciple of renowned vocalist Shree Vaman Acharya Ji. She has a Masters degree in classical vocals from Allahabad University. She developed an interest in music at a young age due to the influence of her father, who was a great musician and performer of classical songs, bhajans and ghazals. She has performed widely in India and the US, been featured on Disha, Sanskar, TV Asia, and ITV, and her vocals have been used in the making of documentary films. She regularly performs and collaborates with touring artists. She has vast experience in teaching music to children. 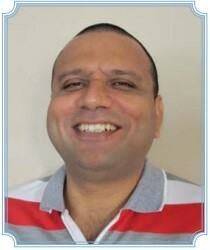 Avinash Pancholi has been teaching English as a second language (ESL) at Department of Education New York City Public Schools for over 18 years. As an ESL coordinator, he has taught English to students of various linguistic and cultural backgrounds; and also trained teachers. He has taught Hindi as a foreign language to native and non-native speakers of the language. 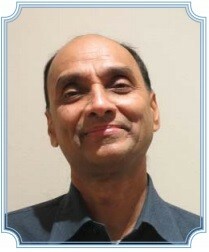 As an honorary teacher, he has taught Hindi and Gujarati at a number of Indian cultural organizations. Avinash has earned three masters degrees – an M.A. in English/linguistics from India and an M.S. in journalism from Iowa State University (ISU) and an M.S.Ed from a New York college in ESL. A winner of one gold and two silver medals from Bharatiya Vidya Bhavan, Mumbai, and a graduate scholarship from ISU, Avinash was a professional journalist for over 12 years with prestigious international news agencies and newspapers in India and America.